Crank system for smooth opening and adjustment. UV resistant 180g polyester cloth canopy. Doesn't fit into normal table stands. This is the summary of consumer reviews for Outsunny 15' Outdoor Patio Market Double-Sided Umbrella - Cream White and Brown. The BoolPool rating for this product is Good, with 3.20 stars, and the price range is $89.99-$110.00. The Outsunny 15' Outdoor Patio Market Double-Sided Umbrella - Cream White Brown is a very large double sided umbrella that has a canopy of UV resistant 180g polyester cloth. It opens and closes with a metal hardware crank system, does not come with a base, and is designed to fit into standard 2” tables. If you want a very large umbrella that provides coverage from sun and rain, this is the umbrella you’ve been seeking. Not only is its canopy large enough to provide shade on sunny days, it’s large enough to cover two full tables with its impressive double-sided design. Opening, closing, and adjustment is smooth and easy thanks to its metal hardware crank mechanism. The canopy is also made of UV resistant polyester to mitigate the chances of sunburns. Some commenters have dubbed it a behemoth and this is an accurate name. There are, however, many who are unimpressed with this umbrella. 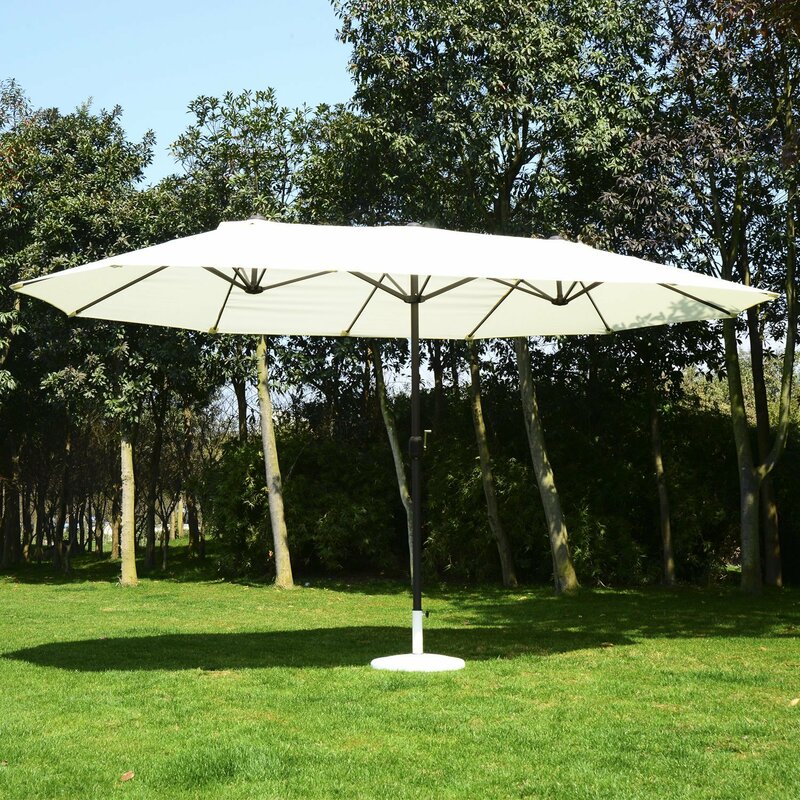 Customers have had difficulties fitting this through the standard 2” table holes it is designed to accommodate and its large size makes it vulnerable to winds which twist and may shatter the pole supporting the canopy. It’s too much umbrella for its design and the lackluster materials it is made from. It is, ultimately, a very large umbrella that can’t support itself in standard tables with 2” diameters and does not come with a base. While the UV canopy is impressive, it may not survive for long with usual winds speeds. The only thing wrong so far is that when a gentle wind blows it turns it. Only complaint is it's a little cumbersome to raise and lower. This umbrella spans both tables comfortably. I keep it lowered down until we use it to deal with the wind issue others have faced which would be an issue since it's relatively lightweight compared to other umbrellas. So far so good with this, we were worried based on the price and the size of it (due to wind). Going to try a screw to hold it in place, we'll see. We've figured out that it's turning at a seam above the table (not from the stand). I've two patio tables pushed together and in the past had two umbrellas over each (not ideal as they bumped up against each other). DON'T BUY RECOMMENDED STAND it isn't heavy enough to support the umbrella. Pole is heavy duty aluminum and the price can't be beat should have bought 2 when I'd the chance would definitely buy again but probably won't get it for same price. But I'd absolutely buy this again! Had to buy a larger stand and even after adding 50lbs of sand, we've to tether it to keep it from turning. coverage from the sun on my deck!. It looks great, decent quality, and is totally worth the price. Far exceeded my expectations best thing I've bought great quality fabric and construction. Literally had this umbrella for less than 2 months and it's already broken and of course we can't return it because the "return window is closed" don't buy this umbrella unless you only need it for a month. I thought I found the solution to not having enough. It withstood quite a few gusts of wind and didn't bat an eye. When open, it's held up well to the winds we've here (highest wind i've recorded with it open is 22 mph). This's an excellent umbrella and it covers my entire porch when opened. Great on shade and was extremely cool the moment we opened it up. I'm stuck with a one-half open umbrella. It definitely takes two to open it up but set up was a breeze...out the box...pop in the hole...and crank away...ta-da!!. Umbrella handle indicated wrong way to turn to open the umbrella. When you open it you need to make sure you've enough space because it's big. With any decent amount of wind, the umbrella pole will bend. My was ruined after two uses inbreeze up to 15mph in gusts. It turned over and broke within one week of purchase. Broke after one gust of wind. It blew away and broke three arms!!! A small storm came along and the umbrella pole broke in half. That wasn't enough, it blew over and broke the stand. Not very durable broke third day. Pieace of junk broke and threw out never could get it to stay up wind always nocked. The concept was great but the material was poor quality and it broke quickly!. The pole came apart right above the threaded connection. Top heavy and won't fit in an average stand. The pole fits the standard table holes. Yes, it didn't fit the stand. This baby fit the bill to perfection! It didn't fit the stand I already had, so had to buy one that'd fit it. This fit my patio perfect and saved tone of money over building a permanent cover. It wont work in a standard stand I'd to retro fit it to work. This umbrella is beautiful but the pole didn't fit in the hole opening of my table and I'd to return it. Would have been nice to know that this umbrella doesn't fit into normal umbrella stands or tables that've holes for umbrealla in middle the hole is too small to accomodate the larger size umbrella circle. Got it and it won't fit a 2" umbrella stand as stated. Love love love bought 2 happy very large sturdy. Love the size and pleasant look. I Love the space it covers for shade. Love this umbrella - it covers most of our patio and provides much needed shade. I bought one for my son and they love it. Everyone loved it at our BBQ.